ABC did not have polling. They did however ask voters in Liberal seats in Victoria who they were going to vote for in Vox pop fashion. All said not Liberal. Reporters comment was these voters in “safe” Liberal seats were not hard to find. I’ll pass on the well wishes of everyone here to Louise, the owner. Lou has had a few dogs over the years. She likes the company, and she’s a sucker for a sad story, or a dog down on its luck. She gave 110% to get Ruby over the line, but Ruby became too mental to handle and, in the vet’s assessment (the vet knew Ruby quite well) had changed comprehensively, just in the past few months, and would have started chewing on people, soon, not just brush turkeys. Ruby was not having fun under the house chasing her demons. She was in great distress: a distress that nothing – not food, sleep, nor love – could deal with. It was awful to witness. Lou has a cat as well. We had a laugh between the tears this morning, joking that it was the cat that had told Ruby about a large nest of rats under the house, tough rats, rats that needed lots of barking to root out. Go get ’em Ruby! The cat’s life has changed for the better since Ruby took up living under the house. As far as the cat’s concerned Ruby could have stayed there permanently. They never got on at all. The cat will be pleased Ruby’s gone. For myself, I always had a feeling that Ruby was destined for a bad end. She had too big a personality, far too little restraint and very large teeth. That can be a bad combination. Unions were forced to apologise to the electoral watchdog after posting unauthorised fake eviction notices on the offices of two Liberal MPs in marginal Victorian seats. The mock eviction notices were recently put up at the offices of Sarah Henderson, the Liberal MP for Corangamite, and Gladys Liu, a candidate for Chisholm. Just got polled by Ucost/Ucomm? normal questions plus a lot of questions on indigenous rights. As an atheist, Easter doesn’t have any special meaning for me. As a fisherman Easter has special meaning for me. Did you notice one of your regular assertions was skewered with this latest Newspoll? A big swing to major Parties as the second tier boutique parties lose ground. Looks like voters will be going the full lmonty in this Election. I can understand Mr Gibbs being cheesed off at having to pay a $1500 imaging bill this morning, but really, what could Shorten have done about that? What could Dan Andrews have done about it? You cannot run the country from Opposition. That’s why we have elections. That a journalist – more accurately: a subbie writing headlines – thinks this is a disaster for Labor, is pathetic and a shame on the newly tabloid SMH, more concerned with Reality TV as reality, than the real issues in this election. Thanks for cheering me up. Listening to ABC radio during the day while driving is really depressing. Zali Steggall speaks about that creepy Capt GetUp video. Haven’t seen any comment from Abbott distancing himself from, or calling out the video for its sick imputations. Those expecting only the Coalition and Labor to be included will be as surprised as I was to see the Greens included as a major party. 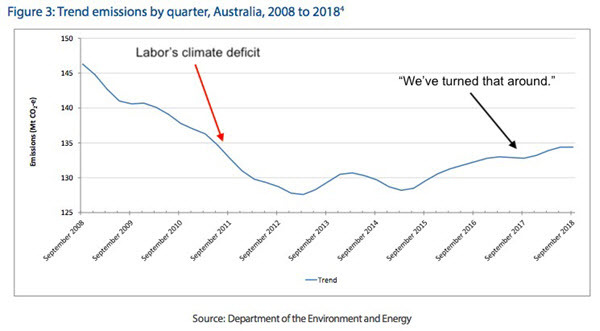 Bernard Keane nails Morrison for a whopping carbon emissions lie. The long term trend is the Greens are dying. Eaten from the inside out with their poor choice of candidates, internecine fighting and not being able to articulate what they stand for. Did anyone else get the email from GetUp encouraging people to enrol to vote? I had this discussion with William a little while ago as to whether the marriage equality vote will put more younger people on the electoral roll this time around, or whether it just brought forward some enrolments. William seemed to be saying the latter (forgive me if I misread that William). However, I’d still like to see the actual numbers. Especially after enrolments close. Bernard Keane also points out how bad it’s going for the LNP. Thanks to prepolling a lot of voters will have voted by the time of the last week of the campaign. Time is as much the enemy as Labor for the LNP. So going on that brilliant tactics Labor. Getting the LNP not to campaign over Easter is not going to win them seats. Having caught up on today’s thread, I see the supporters of a two-party state have been in full flight. Your anti-democratic tendencies are showing. Hewson lost because he couldn’t explain his own policies, Howard didn’t win 2001 during the campaign. What is with this pant-wetting? I’m not delusional, elections can go wrong. But for Christ’s sake … if you don’t believe you’re going to win, I can guarantee you the outcome. we should all share and keep saying this, outrageous….. I enjoyed reading Frances Flanagan’s August 2018 piece entitled The Policy and Politics of Basic Income. I share her conclusion that a UBI does not challenge the commodification of vast swathes of our social and cultural lives. In that sense, it is a policy that lacks ambition and imagination. I would go further by observing that a UBI would be macroeconomically unstable. It has no inflation control built into it. This is the main practical reason to favour a targeted Basic Income over a Universal Basic Income. A generous Basic Income that reflects the society’s productivity level should be provided to people of retirement age, people who are sick or injured, and people with disabilities. It would be an automatic stabilizer that targets just the right amounts of federal spending in just the right places to provide genuine full employment with price stability at all times. It would be a public option for jobs that would widen the cultural imagination of what paid work can be and increase the quality of workplaces and job design for everyone (because people would have a good public option to turn to if the private sector failed to create interesting and fulfilling jobs and respectful workplaces). It would empower cooperatives, not-for-profit social enterprises, NGOs, and local governments to design jobs that care for people and care for the planet. It would make jobs a lot more flexible for people who experience disability, mental illness, personality disorders, substance addiction and other struggles that currently exclude them from fulfilling paid work. Universal guarantees of good quality affordable housing, public services, and public infrastructure are also needed. There is not much point in guaranteeing everyone a certain income if people are not getting the goods and services that they need for a decent life. I think that government is designed to solve problems that are public, collective, and shared. The systemic and structural responses to the problems must also be public, collective, and shared. A UBI perpetuates the myth that our problems are primarily private and individualistic in character. Increasing the social wage by providing public services and infrastructure with zero out of pocket fees is a much better way of lifting everybody’s living standards than a universal payment that significantly increases total demand but does not directly increase the supply of goods and services. Legislating that a fixed portion of average productivity growth be allocated to a shorter working day, a shorter working week, and more weeks of annual leave is a much better way of increasing people’s leisure time than a UBI. Using a Job Guarantee to drive the unemployment rate down to 1 or 2 percent, eradicate time-related under-employment, and eradicate hidden unemployment will do much more to increase workers’ bargaining power and working conditions than a UBI that would probably become a wage subsidy for employers rather than a net benefit for workers. Changing employment law to favour workers would directly reduce exploitation in employment relationships. The Commonwealth Parliament could legislate to allow industry-wide bargaining, to allow unions to collect fees from non-members who benefited from agreements negotiated by the union, to make it easier for unions to access workplaces, to strengthen the rights of casual workers to upgrade to permanent employee status, to make labour hire firms and the ultimate employer jointly liable for meeting workplace health and safety and employment standards, to compel labour hire firms to get a license, and to widen the definition of employee to include any worker whose pay and conditions are determined mostly by one major firm. The evidence doesn’t support the view that an employment relationship is inherently oppressive. The exploitation stems from a macroeconomy that is far short of true full employment, and from employment law that heavily favours employers. Address those two problems and the quality of employment improves dramatically. Guaranteeing people good quality employment provides many psycho-social benefits that income alone cannot match. By every relevant measure, employment guarantees and service guarantees thrash the UBI concept hands down. Bluey had a mate who was into sabres and it hurt. FYI we’ve had success in reaching out to a national science academy to secure its eminent scientist for National Science Week keynote presentation and school incursions here. And not only is she a woman (always great to profile women in the sciences, esp for younger generations), but she’s based in WA, and her research interests have relevance to our region. I just wanted to say thanks to you for making enquiries with your networks, even if it didn’t amount to anything concrete in the end. I have absolutely no doubt that the ME vote mobilised first time voters to get themselves onto the electoral roll. At the time there were a few PBers who had kids/grandkids/nieces/nephews who were chomping at the bit to enroll so they could vote in the plebiscite. Thanks for letting me know. I hope it all goes really well for you! The Greens are welcome to displace the LNP. Nicholas. Once again you descend into hand waving generalisations loaded with value judgements about human behaviour. It’s unbecoming because sometimes you talk sense. But on the subject of a UBI you’re ideologically driven. Thanks D&M. I’m actually looking forward to helping pull it all together and attending some of the local activities. Anti Union and doing the Liberals dirty work for them now, Pegasus, by putting that here? The trend of interest that I bring up and referred to by GG is the increasing vote share of the non-major parties, not the vote share of the Greens party. There is no doubt that once those young people were on the roll they were on it. I think it got a few on that would otherwise not have enrolled to vote. Its easy to overstate the significance but it is significant given young people usually avoiding enrolling until later. With regards enrollment of younger cohort following ME , I recall that either William or Kevin Bonham said that historically increases in enrollments in these types of situations just result in higher rates of not voting in following elections. Kudos for your clever riposte. The latest Newspoll shows the exact opposite. Major parties increasing their share of the vote. Congratulations to the Australian Women of Astrophysics! Bravo! ‘Tis true, they are becoming bluer as time goes on. It can certainly break one – if it ever existed. Anyway, off to my branch meeting. That vote just drifts away……. The real significance of the ME survey was that it showed how far the LNP right had moved away from their electorates. Its a political shockwave that saw the right panic and replace Turnbull. Its part of the reason I think those “safe” seats are in danger. It woke the “moderate” Liberals up as well.